A delectable triple delight of deliciousness. 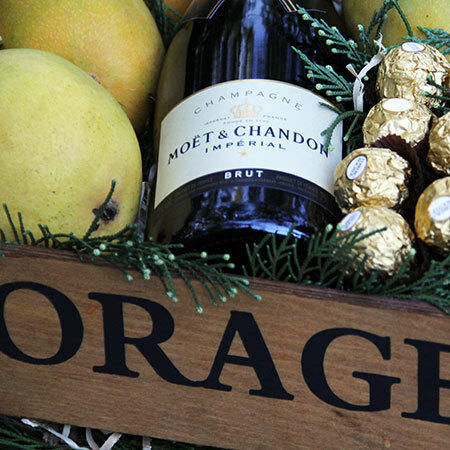 This beautifully presented Xmas hamper boasts tropical mangos, Moet & Chandon sparkling wine and Ferrero Rocher chocolates. Ideal to share (or have all to yourself), this quality hamper for Christmas is designed in a re-usable timber crate and decorated with fresh spruce for a little festive flair. Order our Xmas hampers online or phone the team on 1800 66 66 46. 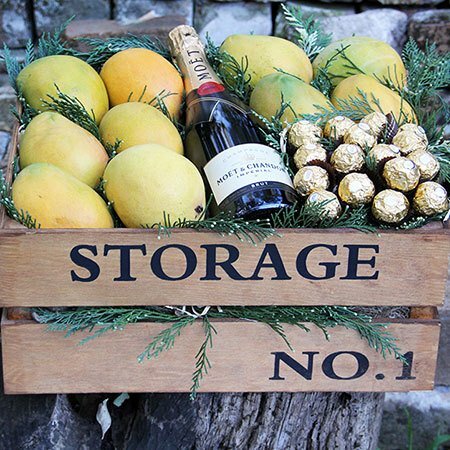 *Please note: The pictured hamper and wooden crate is exclusive to Sydney delivery only. For Xmas hampers outside Sydney, our team will coordinate your order via an affiliate florist network to recreate our style and content as closely as possible. Order five or more of these quality hampers for client Xmas gifts or staff gifts, and receive $34 off the retail price. To arrange, please call our Xmas elves on 1800 66 66 46 or email directly.